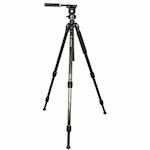 The Leupold tripod is a compact tripod with 4-section legs that extend the tripod to 31 inches and close to 15 inches. Complete with an adjustable ball head with quick-release plate. The Leupold compact tripod is great for when you need to go small. Leupold offers inexpensive aluminum compact tripods for back country use with their optics.